ASTANA – Kazakhstan and Japan will implement seven joint projects, including in the areas of nuclear energy, transport and water supply, worth approximately $2 billion, Kazakh Minister for Investments and Development Zhenis Kassymbek announced at a June 27 meeting with Vice Minister of Economy, Trade and Industry of Japan Tadao Yanase. Japan is one of Kazakhstan’s key strategic partners in East Asia. Ten joint large-scale projects were implemented for a total amount of more than $1.1 billion. An agreement to promote and protect investments between the nations took effect in 2015. “We have strategic and friendly relations between our countries. We see mutual interest and prospects for cooperation with Japan in areas such as petrochemicals, infrastructure, pharmaceuticals, energy, information technologies and innovations,” Kassymbek said. Yanase emphasised that Japanese companies are interested in investing in Kazakhstan. As of the first quarter, trade between the countries reached $460.9 million. The figure was $236.2 million, which is two times higher than in the same period of 2017. Exports from Kazakhstan amounted to $368.6 million, 1.5 times more than the $177.9 million of the same period the year before. 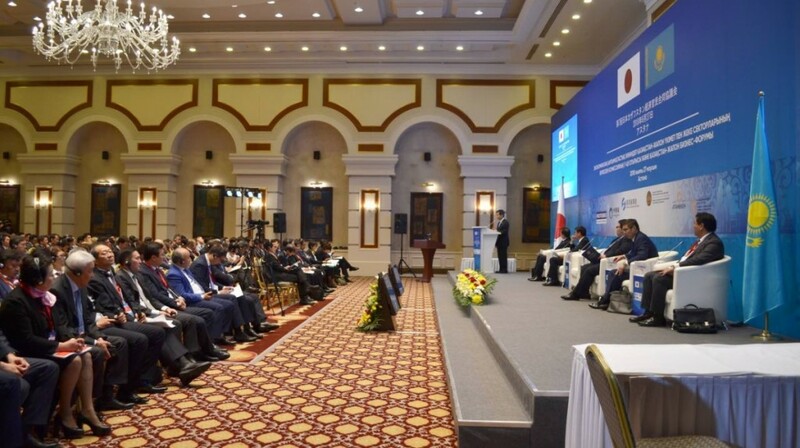 “Since the first years of independence, Kazakhstan’s policies were focused on ensuring economic growth through creating favourable conditions for foreign investors,” said Kazakh Vice Minister for Investment and Development Arystan Kabikenov at the Kazakhstan-Japan Business Forum on the same day. Kabikenov also noted that Japanese companies have been invited to participate in Kazakhstan’s privatisation programme. “Now we need to implement new initiatives in accordance with our development strategy. Last year, the Kazakh government adopted the Digital Kazakhstan programme and I would like to see further development of specific bilateral relations in many directions,” said Toshiyuki Kosugi, Japan-Kazakhstan Economic Commission deputy chairman and ITOCHU Corporation advisor. Kazakh Invest Chairman Saparbek Tuyakbayev and Vice Chairman of Marubeni Corporation Shigeru Yamazoe signed a memorandum on the development of urban transport in Almaty. “We are currently working on a light rail system in Almaty as part of the public-private partnership programme. In addition to construction, operation, maintenance and financing issues, we are working to create a digital infrastructure, considering LRT as an integral part of urban planning, and thus striving to provide comfortable living conditions for citizens,” said Yamazoe. Agreements on pilot projects in heat and water supply systems between the KazCentre for Housing and Utilities, Mitsui & Company and Japan System Planning companies and a memorandum on nuclear energy between Kazakhstan Nuclear Power Plants and the Japan Atomic Power Company and Marubeni Utility Services were also signed at the event. More than 50 joint enterprises and 77 companies with the participation of Japanese companies work in the country. The gross inflow of direct investments from Japan exceeded $5 billion over the last 12 years. Kazakhstan exported ferroalloys in the amount of $534.3 million and oil and petroleum products of $339.4 million in 2017. These two positions accounted for 98.6 percent of all exports to the Japanese market as Kazakhstan has great potential to export more agricultural products, including grain, flour and meat. Last year Kazakhstan imported mainly goods of the Japanese automotive industry and special equipment including cars for $164.4 million, special vehicles for $47.3 million, medical devices and equipment for $19.6 million, large road vehicles for $12.1 million and tires for $11.7 million.